Fans of the sublimely talented James Morrison will be thrilled to know he is on his way to Bexhill. The singer songwriter who made his name in 2006 with debut single You Give Me Something is poised for a new chapter in his already amazing career. His next album You’re Stronger Than You Know will be released on March 8. He brings his new tour to the De La Warr Pavilion on Tuesday March 26. 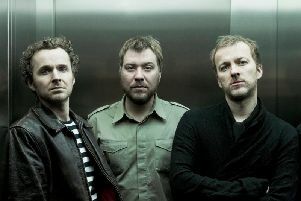 Doors open at 7pm and tickets cost £28.50 from box office on 01424 229111 or www.dlwp.com. Tickets go on sale online to members on Thursday January 24 at 9am and the date for the rest of us, also online, is Friday January 25 at 9am. This will be his first full UK tour for three years although he is also performing international gigs in South Africa and Germany. With two number one albums, five top 10 singles, a BRIT Award and 7 million sales, Morrison is one of the biggest success stories of his era. His new album on Stanley Park Records is previewed with lead single My Love Goes On which is a modern soul anthem with vocals from Joss Stone. Their connection goes back to when she presented him with the BRIT Award for British Male Solo Artist in 2007. The track is accompanied by an official video, which captures a beautiful performance from James and Joss in a recording studio in Chicago. Harking back to the Stax and Motown eras that he loves, You’re Stronger Than You Know is the album Morrison always wanted to make. Vocally he’s never sounded better, with his honest songwriting inspiring a voice that exudes power, tenderness and experience. While the album possesses some darker moments, the overriding feeling is a beacon of light in a climate of bad news. James has in the last few years been through some tough times but gradually overcame his struggles in writing new songs until he realised that he had some of the best material of his career – and more than enough to make an album. It’s a collection which sees him bravely digging into his emotions over the past four years. It’s particularly striking in the powerful centrepiece Slowly, in which he questions how to reignite his creativity and tackles his tumultuous upbringing with his parents. Family is also a consistent theme throughout the record. The uplifting closing ballad Until The Stars Go Out was written in support of his eldest daughter when she was bullied in school. He wrote So Beautiful with Gary Barlow a decade ago, but only recently discovered that the song spoke to his current feelings. For the first time in his career, Morrison made the record with one producer (Mark Taylor), at British Grove Studios in London which provided the perfect location for recording with a balance between vintage equipment and modern technology. The core of the album was recorded within a week, before a second was spent adding the finishing touches – overdubs, backing vocals and horns. Set to be released on CD, vinyl and digital formats, You’re Stronger Than You Know is now available to pre-order, with My Love Goes On provided as an instant download. Visit www.jamesmorrisonmusic.com for all details of the album and a full list of tour dates and ticket details.